Michiel Adriaenszoon de Ruyter was a famous Dutch admiral, born of poor parents at Vlissingen (Flushing) on the 24th of March 1607. It is said that as a boy of 11 he started serving in the Dutch merchant and naval service. 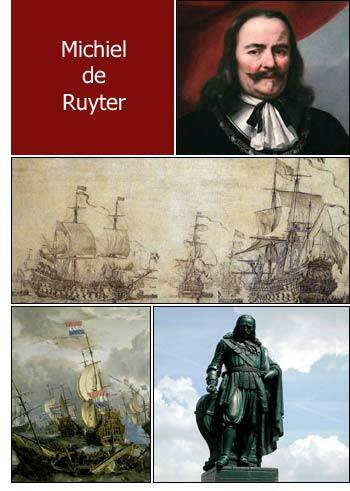 De Ruyter commanded a Dutch ship under supreme commander Lieutenant-Admiral Maarten Tromp in the war with England 1652-1654, and he was ennobled in 1660 by the king of Denmark for services rendered in the Dano-Swedish war. Michiel de Ruyter commanded the Dutch fleet in the second war against England, and in 1667 surprised England and London by appearing and burning the shipping in the Thames, resulting in the loss of the British flagship HMS Royal Charles, bringing the Dutch close to London, and an embarrassing defeat for the English. In 1676 he took command of a combined Dutch-Spanish fleet to help the Spanish suppress the Messina Revolt and fought a French fleet under Duquesne twice at the Battle of Stromboli and the Battle of Agosta. It was there that he was fatally wounded when a cannonball hit both his legs. De Ruyter died on April 29, 1676. On March 18, 1678 Michiel de Ruyter was given a state funeral. His body was buried in the New Church (Nieuwe Kerk) in Amsterdam. He was succeeded as supreme commander by Maarten Tromp's son, Cornelis Tromp in 1679.